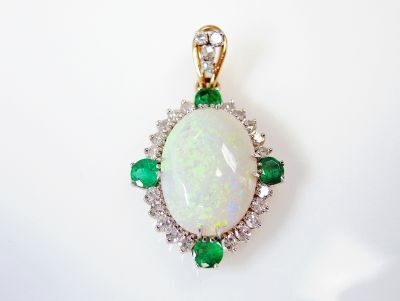 A beautiful vintage 14kt yellow and white gold pendant featuring 1 oval cabochon white yellowish green-reddish orange opal, approx. 7.52ct; 24 single cut diamonds,est. 0.94 (clarity:Vs & G-H colour) and 4 round faceted cut medium green emeralds, est. 1.03ct.